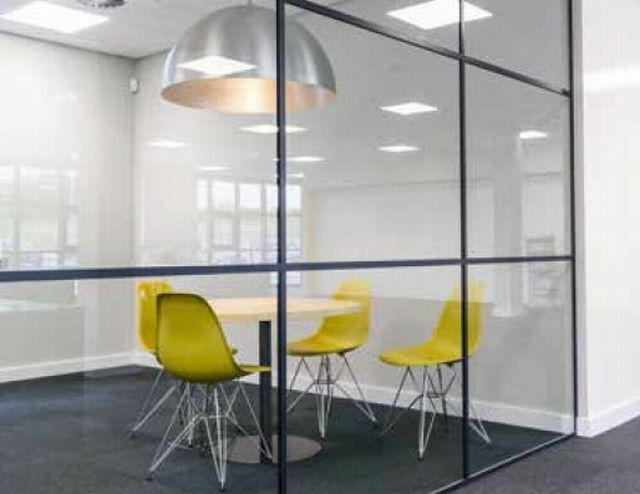 Single glazed partition system with 20 mm wide framework, offering the opportunity to create the original, retro feel of the ‘Art Deco’, New York loft style, banded glazing. The system is ideal when combined with frameless, all glass door leaves, which can have banding applied for a consistent look. If privacy is a requirement, the system can be combined with the slim framed IsoTec doorset, for performance without compromising the aesthetic. Can be manufactured to conform with BREEAM, SKA and LEED requirements, contact manufacturer for more information. The slender framework and striking bands lends itself to a multitude of environments and uses. It is popular in both corporate and residential projects and can be used for anything from office room dividers, where acoustics are low priority, to creating an industrial feel in a domestic property. 27 x 20 mm (d x w) two-part aluminium channel. LOFT 25 mm aluminium glazing bar bonded to both sides of glass. Available up to 3500 in height (for partitions over 3000 mm in height, please consult manufacturer for further information). - Planet Eclipse Sliding door system. Planet IsoClear 12 mm door leaf - non-acoustic. Planet IsoClear 12 mm door leaf - 34 dB (Rw). Planet IsoPro double glazed metal framed door leaf - 39 dB (Rw). Planet IsoPro double glazed metal framed door leaf - 42 dB (Rw). Planet IsoPro single glazed metal framed door leaf - 34 dB (Rw). Planet IsoTec 12 mm door leaf - non-acoustic. Planet IsoTec 12 mm door leaf - 34 dB (Rw). Planet Sonotec double glazed metal framed door leaf - 39 dB (Rw). Planet Sonotec double glazed metal framed door leaf - 42 dB (Rw). Planet Sonotec single glazed metal framed door leaf - 34 dB (Rw). Timber 44 mm leaf on hinges - 32 dB (Rw) with threshold seal. Timber 54 mm leaf on hinges - 33 dB (Rw) with threshold seal. Planet IsoPro double glazed metal framed door leaf (non-rebated) - 31 dB (Rw). Planet IsoPro double glazed metal framed door leaf (rebated) - 33 dB (Rw). Planet IsoPro double glazed metal framed door leaf (rebated) - 35 dB (Rw). Planet IsoPro double glazed metal framed door leaf (rebated) - 36 dB (Rw). Planet Sonotec double glazed metal framed door leaf (non-rebated) - 31 dB (Rw). Planet IsoClear 12 mm door leaf on hinges - non-acoustic. Planet IsoClear 12 mm door leaf on offset pivot - non-acoustic. Planet IsoPro single glazed metal framed door leaf (non-rebated) - non-acoustic. Planet IsoTec 12 mm door leaf on hinges - non-acoustic. Planet Sonotec single glazed metal framed door leaf (non-rebated) - non-acoustic. Timber 44 mm leaf on hinges - non-acoustic. Timber 54 mm leaf on hinges - non-acoustic. Should be in accordance with the requirements of Approved Document K.
The product information below is from the NBS Plus library of product clauses offered in NBS specification products. It has been created by NBS for Planet Partitioning. Each product clause is authored in NBS format and is intended for inclusion in project specifications. Please note that NBS product guidance is not a replacement for the manufacturer's literature and it is recommended that Planet Partitioning be consulted before specifying. As drawing - Insert reference. 27 x 20 mm (d x w) aluminium channel (K201–K204 to suit). 60 x 35 mm (d x w) two-part aluminium channel (K205–K208 to suit). 90 x 35 mm (d x w) two-part aluminium channel (K209–K212 to suit). 145 x 35 mm (d x w) two-part aluminium channel (K623–K626 to suit). Insert requirements, for timber doors. Insert requirement, artwork and custom manifestations are available, contact manufacturer for information.